Check our handmade bracelets and necklaces. Agates are one of the most interesting stones around because they come in so many different color and shape variations. They can be found in all colors of the spectrum, and often have beautiful inclusions that make them even more special and unique. Agates are usually a part of volcanic rocks or ancient lavas and are extracted all around the world. Although they had many purposes during their long history, today agates are mostly used for jewelry. Our silky red agate is formed into beautiful loose beads that are perfect for making bracelets and necklaces. They simply need to be threaded so even beginner jewelry makers can create gorgeous accessories. This silky red agate is special because of the white inclusions that run throughout the beads, creating a stunning color contrast. The red/orange color is also very eye-catching and perfect for someone with an outgoing personality. But not only are these agate stones stunningly beautiful, they also carry a powerful energy that can be used for healing and improving oneself. Each agate has different metaphysical aspects so you can choose one or more that will benefit you the most. For that reason, when you’re making agate jewelry, you can combine a couple of different stones that will represent your personality and traits, as well as attract all the things you want in life. 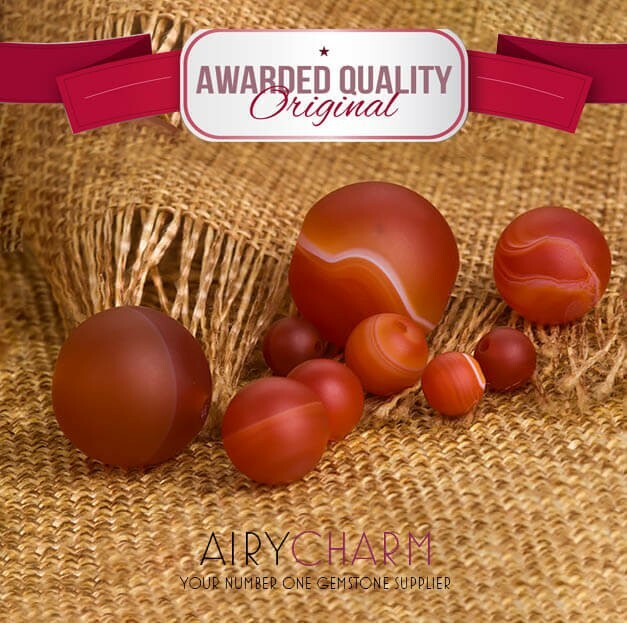 Because of its color, silky red agate corresponds to the first or root chakra. This chakra is responsible for your basic instincts, feeling of safety and grounding. So if you feel like you need to connect to the earth a little bit more because your thoughts and feelings are all over the place, it’s a good idea to wear silky red agate jewelry. As well as if you want to feel a bit calmer, more relaxed or if you suffer from any kind of stress and anxiety. Being grounded helps you react calmer, make better decisions, and not get overwhelmed. So if you’re a busy and career oriented person, keep a red agate close by. 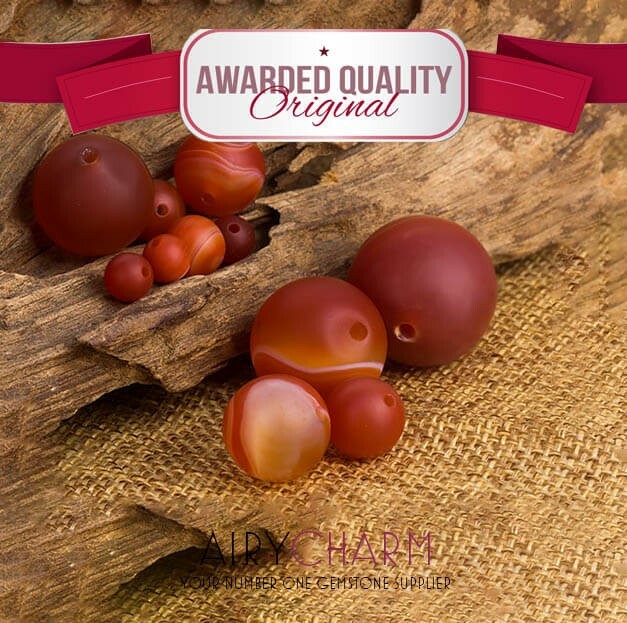 If your star sign is Pisces or Cancer, red agate is a stone that corresponds to your zodiac. Those two signs are considered to be very sensitive and emotional which can be a good and a bad thing, depending on the situation. But being overly sensitive is usually not desirable because that means other people’s bad energy influences you much more than other people. Red agates are protective stones that help Pisces and Cancer to have more stability and be less affected by others which results in more confidence, feeling safe, secure, and good about yourself. Red agate is recommended for all performers and public speakers because of its calming and confident energy. It promotes eloquence and good social skills. If you have problems with communicating or feel shy in a large group of people, wearing red agate jewelry will help you stand out and not get so anxious when speaking. Because red is such a powerful color, you will definitely look more appealing, self-assured, and fearless. And that immediately sets you up as a strong person when people first see you. After the order is placed and confirmed by the payment processor, we will process it and ship to you within 24 - 72 hours (except for weekends when the post office is closed). If you place a wholesale order for beads with quantities over 1000, please allow it few more days to process.